In partnership with the McKinsey Center for Business and Environment, Ocean Conservancy has released the Stemming the Tide report to reduce ocean plastic waste by 45% by 2025. The report is said to be a first of its kind that outlines specific land-based solutions for plastic waste in the ocean, starting with the elimination of plastic waste leakage in five priority countries- China, Indonesia, Philippines, Vietnam and Thailand. 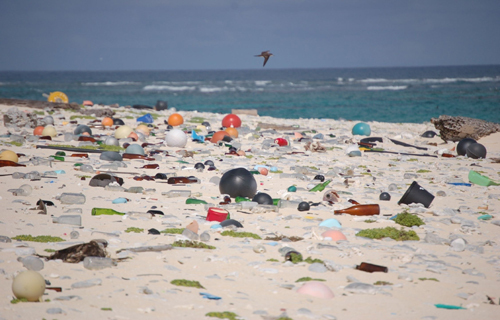 According to the report, 8 million metric tons of plastics leak into the world’s ocean every year and the amounts continue to grow, in addition to the 150 million tons estimated to be there already. Without concerted global action, there could be 250 million tons of plastic in the ocean by 2025, leading to massive environmental, economic and health issues. With at least 80% of ocean plastic originating from land-based sources, the report’s findings propose a four-point solution to cutting leakage by 45% in the next 10 years, dramatically reducing ocean plastic waste by 2025 with the ultimate goal of eradicating the issue by 2035. These major solutions include: Closing leakage points within the collection system; increasing waste-collection rates by expanding collection service; using a variety of waste-to-fuel (e.g. gasification) or waste-to-energy (e.g. incineration with energy recovery) technologies to treat waste; and manually sorting high-value plastic waste and converting much of the remainder to refuse-derived fuel (RDF). The report estimates that total costs for implementing these solutions could be contained at US$5 billion a year, with significant returns to the global economy. In the long term, Ocean Conservancy suggested the importance of developing recovery and treatment technologies, advancement of new materials and product designs that better facilitate reuse or recycling, adoption of alternative food and beverage dispensing concepts, and adherence to the broader principles of circularity to ensure a more sustainable plastic life cycle. As a signature initiative of its Trash Free Seas Alliance, the Stemming the Tide study was published by Ocean Conservancy in collaboration with the McKinsey Center for Business &amp; Environment, and supported by Alliance members, The Coca-Cola Company, the Dow Chemical Company, the American Chemistry Council, World Wildlife Fund and the Recycling and Economic Development Initiative of South Africa (REDISA).